Propelling the Pedestrian | whitespace. As Supreme Court Justice Potter Stewart famously wrote for the 1964 Jacobellis v. Ohio obscenity case, “I know it when I see it”. When it comes to neighborhoods, we know a great one when we see it, though we often can’t quite explain what makes it so special. Through many years of experience, however, we have observed that the key ingredient is a place that is comfortable to the pedestrian. Much goes into having a vibrant, walkable neighborhood: interesting destinations, a lively atmosphere, multiple options for activities, and available, everyday conveniences – just to name a few. The more attractions, the better, but these things don’t always happen organically. Planners and urban designers spend endless hours and huge sums of taxpayer’s dollars trying to find ways to stimulate a neighborhood. 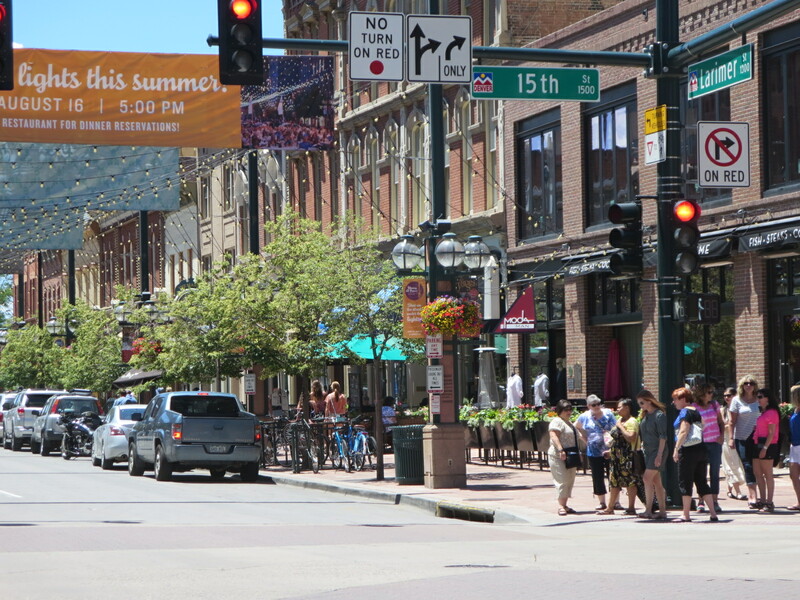 Pedestrians enjoy the outdoor public space at 15th and Larimer in Denver (Image Credit: Robert Whitman, Gould Evans). 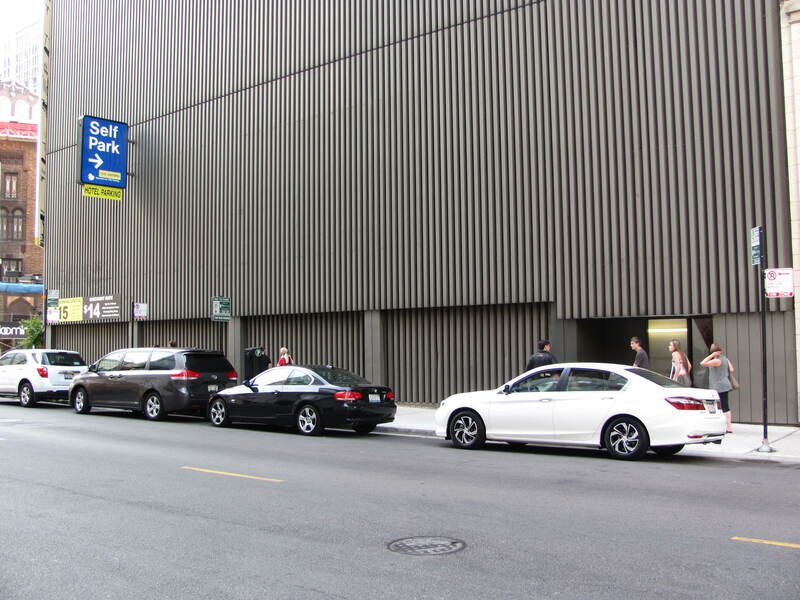 How about financing that new big box retail development? It might seem like a reasonable option because that’s what we see all the time in the news. The “experts” tell us this is what we need – somehow if we add more homes, shopping, jobs and recreation, the neighborhood is certain to become a hot spot that everyone wants to be in. And it might, but it also might not. 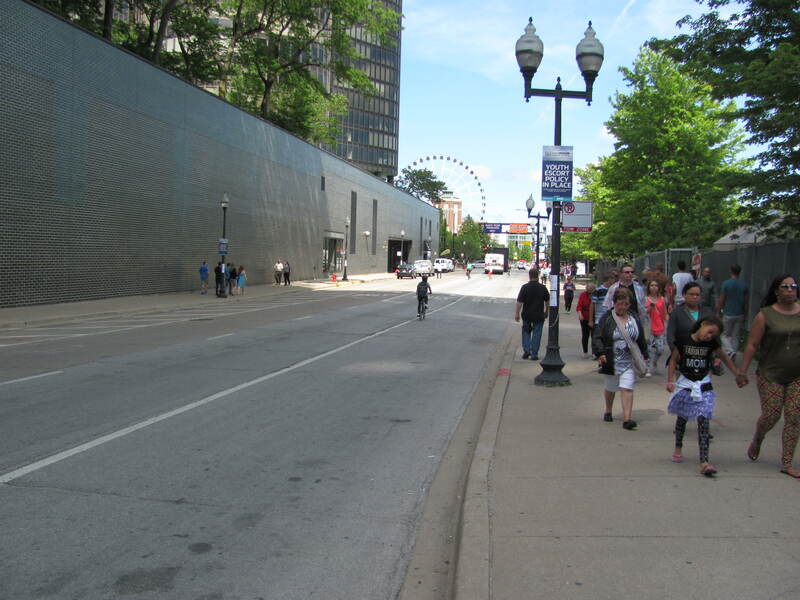 Pedestrians don’t usually linger on blank-walled streets, even those streets people have to use (Image Credit: Robert Whitman, Gould Evans). What draws you to a neighborhood? It’s the people – and the more of them that are seen out and about in an area, the more others are inclined to join. That sounds simple enough. But is it? Development will draw employees, residents and shoppers. Those are people, right? (of course.) And more people will create the great places we were wanting, right? Well, not so fast. Development might draw people to a destination, but how is it drawing them? Are people going to just one destination, then leaving? Are they driving there? Are they arriving by bike or by foot? Are they lingering? Are they visible to us because they are engaging with the public realm? Remember that it is the sight of people that attracts more people. We inherently are interested in watching or being around other people – it entertains us and adds a sense of comfort and security. Just because we have destinations that house many people, that does not mean we have lively public spaces and neighborhood corridors. We need people that are activating the space we all share and see. 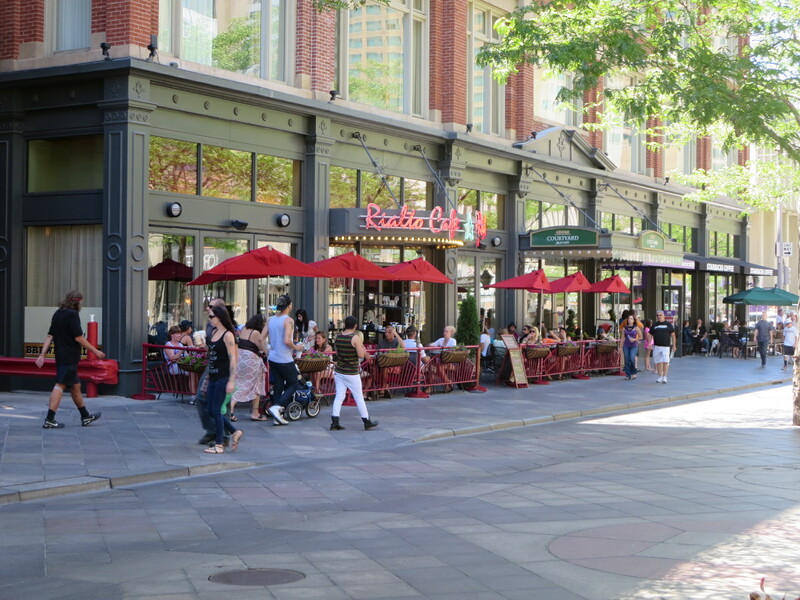 Creating outdoor, vibrant public space for pedestrians to enjoy is key to creating a great neighborhood (Image Credit: Robert Whitman, Gould Evans). It turns out that pedestrians are rather particular about their environment. They need to be engaged, kept comfortable and feel safe. We have spent so much energy and effort focusing only on managing the way automobile traffic moves through our streets that we forgot how to propel pedestrians along them as well. We have ignored the basic needs of the pedestrian all these years. Sure, we have provided them a surface to walk on. But that’s not enough. We need to appeal to their other needs if we want them to engage with a place, explore, linger, walk around and be a pedestrian. 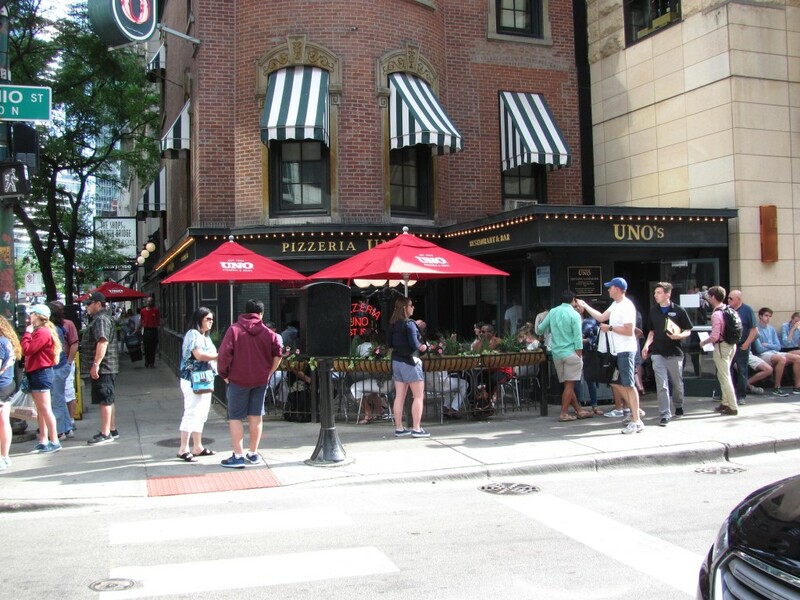 Restaurants in Chicago offer outdoor seating in an effort to appeal to pedestrians walking by (Image Credit: Robert Whitman, Gould Evans). How do we do that? What does it take to appeal to their needs? So, what does a great neighborhood look like? I know it when I see it. The key indicator are people out experiencing the public realm. 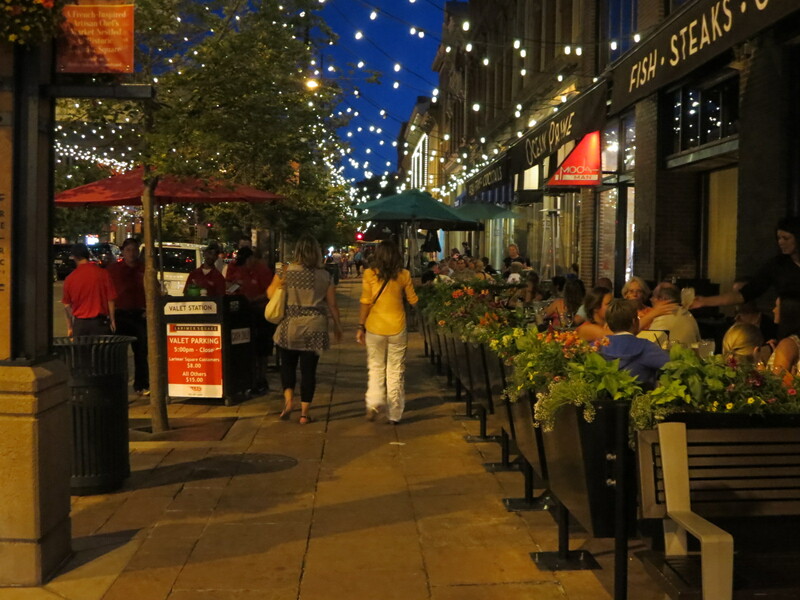 Propel people as pedestrians and unlock the key to a quality neighborhood design. Can you think of any great neighborhoods in your city? What makes them so special? Let us know in the comment box below.